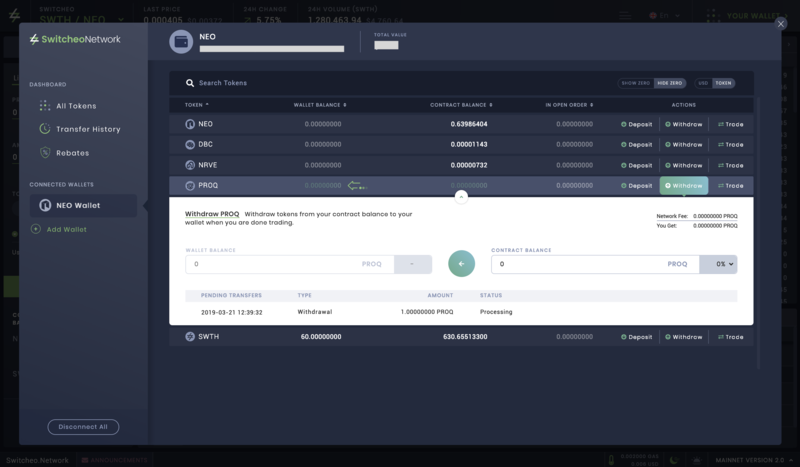 To make a deposit on Switcheo Exchange, click on Wallet Manager. Key in the amount you would like to to deposit, then, click on the green arrow. In the example below, we have selected "SWTH" to be deposited into the contract balance. To make a withdrawal from Switcheo Exchange, click on Wallet Manager. Select the token that you wish to withdraw, and under the Contract Balance address input bar, key in the amount that you wish to withdraw. Then, click the green arrow to proceed.